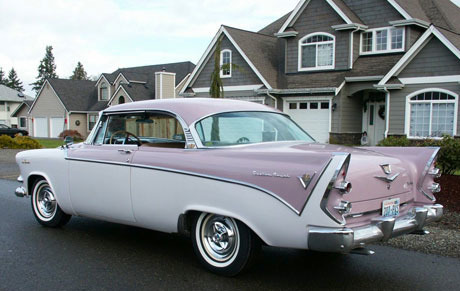 Spotting an apparent gap in the US market in the fifties, Dodge marketed a car aimed solely at women. 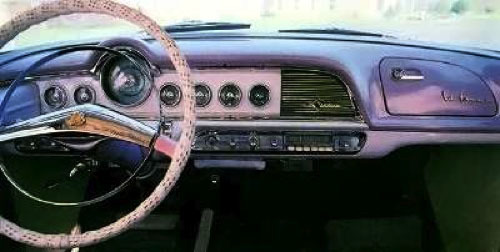 Dodge apparently knew that what women wanted was a pink and lavender paint job, pink upholstery in rose-bud motif tapestry that was easy to clean and a complementary matching rain cape, fisherman’s hat, umbrella and cosmetics case all stowed away inside the vehicle. Ladies – we present the Dodge La Femme. As the press release so gushingly put it:”The jewel-toned interior styling is enhanced by skillful selection of beautiful fabrics. An undertone of golden threads lends depth to the Orchid Jacquard, which was specially developed for this model. Bolsters in gold cordahyde (sic) and an orchid head-lining flecked with gold dots add an extra touch of regal elegance. “Convenient pockets are provided on the front seat backs and contain a set of lovely rainwear created especially for Milady. This consists of raincoat and hat made of fine quality nylon in color matching the interior of the car and flecked with gold to richly enhance its chic appearance. A folding umbrella is also provided and is covered with the matching nylon material. It died a deserved and painful death.